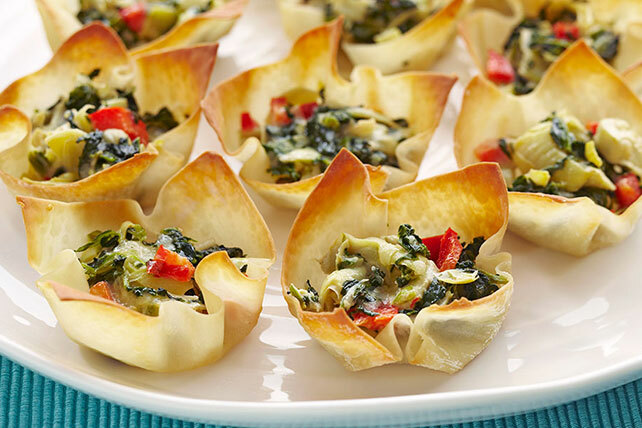 Warm Spinach-Artichoke Cups Improve on the classic dip combo with our Warm Spinach-Artichoke Cups. These better-for-you spinach-artichoke cups are served in individual, savory cups. Place 1 won ton wrapper in each of 24 mini muffin pan cups sprayed with cooking spray, with edges of wrapper extending over top of cup. Bake 5 min. Meanwhile, combine remaining ingredients.